In celebration of its fiftieth anniversary, Gen Con will be staging a museum next month in Indianapolis. The museum will pay homage to Gen Con by showing how the gaming hobby has grown over the past half century from its humble origins to dominate the world. And there's no better way to demonstrate that than with a treasure trove of gaming history. Although four-day tickets for Gen Con are now sold out, if you are lucky enough to have a badge, do drop by the museum. 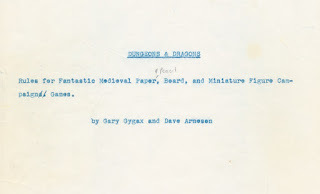 You will be able to see some amazing artifacts like this: a first draft of Dungeons & Dragons. 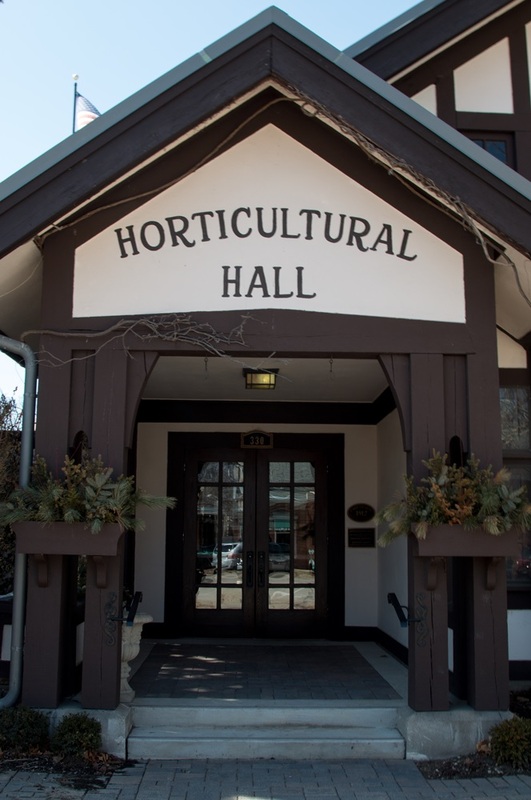 On the gridiron of Lucas Oil Field at Gen Con, you will be able to walk through a replica facade of the portico of the Horticultural Hall, just like the one above. Just in case you didn't catch our party there in March. Beyond it, a scale floorplan of the Hall houses the museum displays. But the museum is about much more than just Dungeons & Dragons. It is separated into six eras that reflect Gen Con's remarkable pedigree. It begins with an Era of Wargames, when Gen Con attendees would play the games of Avalon Hill and SPI alongside Wells's Little Wars and Calhamer's Diplomacy; that era concludes with the beginning of dungeon adventures in Blackmoor. 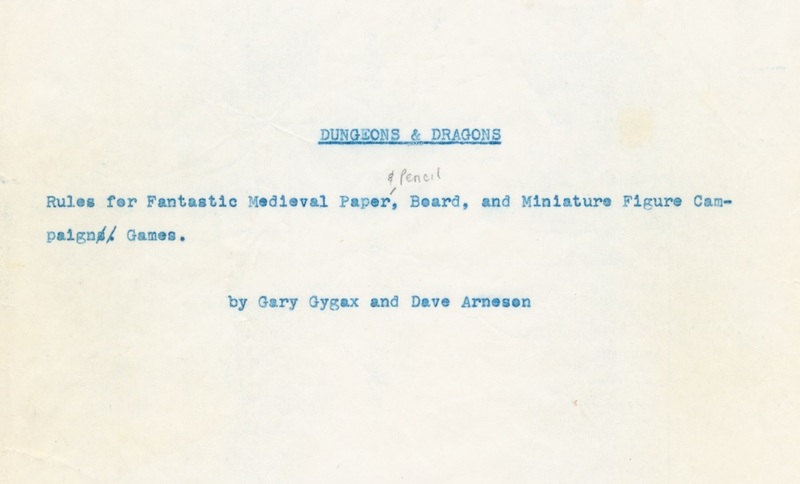 Gary Gygax's convention grew up over these years from a one-day shot in the dark into an annual tradition attracting gamers from around the nation. This was followed by the Era of Dragons, where Dungeons & Dragons took the convention by storm and utterly transformed the gaming industry by inspiring the genre of role-playing games. The rising tide of D&D also lifted the Chaosium, Steve Jackson Games, the Judges Guild, and numerous other publishers who thronged to Gen Con. When the D&D fad crested, it ushered in an Era of Maturity. TSR still ran the convention, but now a diverse set of publishers drove the industry forward. In this era, White Wolf started as a fanzine project and grew into the publisher of Vampire. Innovative RPGs like Shadowrun, Ars Magica, and GURPS shared floor space with diehard wargamers devoted to Advanced Squad Leader. Gen Con, and the industry, would be rocked a second time when Magic: the Gathering debuted at the convention, bringing about a golden age we can only call the Era of Magic. The monumental success of collectible card games enabled Wizards of the Coast to purchase TSR, and with it Gen Con. Wizards CEO Peter Adkison drove the company towards a new edition of D&D that captivated the industry with its Open Gaming License. This era saw Euro games like Settlers of Catan invade Gen Con and lure many gamers back to board games. After Wizards sold Gen Con to Adkison, the convention relocated to Indianapolis: what came next was a time of independence for the convention, an Era of Indie. Thanks to the Internet, new games could develop in cooperative online forums, and reach the world through crowd funding. It was the time of Pathfinder, of small-press games that pushed the boundaries of role playing, and of "old school" retroclones that tried to recapture the spirit of the 1970s. The board gaming renaissance flourished in this era with titles like Dominion, Ticket to Ride, and Agricola. As electronic games grow ever more popular, you might think the tabletop hobby would shrink -- but instead it has exploded. Gen Con has experienced unprecedented growth in the current age, the Era of Expansion. Attendance doubled between 2010 and 2015, and will reach unprecedented heights for the fiftieth anniversary. This era takes in things that are hot off the presses, from 5th Ed D&D to games that will be debuting this year. There will be some great Gen Con memorabilia to see as well. We are offering tours - though again, I gather tickets are already a bit hard to come by. You could catch a tour with Bill Meinhardt, collector extraordinaire and provider of many of the museum's crucial artifacts. Or with Paul Stormberg, auctioneer to the stars, who will be bringing the old school to the Horticultural Hall at Gen Con with his Legends of Wargaming events. Or with a guy named Peter Adkison, tag-teaming up with his dad who has loaned the museum an amazing collection of Magic cards, including an Alpha, Beta, and Unlimited "Power 9" and early sealed boxes. Or with Frank Mentzer, D&D superstar, expert on games history, and fixture at Gen Con. Or with me. But even if you catch us "off duty" I'm sure any of us will be happy to tell you all about the amazing one-of-a-kind artifacts we have on loan from folks like Mike Carr, or Dave Megarry, or Jonathan Tweet, or Mike Mearls, as well from the private stashes of the tour guides. The museum will complement a series of panels on the history of games and Gen Con, which will be populated by a surprisingly similar cast of characters. I'll be talking about some of those, and maybe some of the other cool artifacts to expect from the museum, in the weeks leading up to the Con. Take some time to soak in Gen Con's heritage, and imagine what it might be like in another fifty years. Hopefully some of the tours and exhibits will be shared via video recordings, so that folks not attending GenCon will be able to view the exhibits too. Jon, do you know if anything like that is in the works? Yes, it is my understanding that there will be some video made, but I'm not sure it will be of tours as much as the site. Then again, we didn't actually plan to have Jayson Elliot video us at the Horticultural Hall in March, that just happened... so probably you can't avoid having a video made whether you want one or not. I wasn't aware of Jayson's video from March, will have to look around for that. Thanks Jon, I'd clearly missed that! As I type this, the Bill Meinhardt tour on Thursday at noon still has 6 tickets available. The rest are sold out, unfortunately. Single-day badges are also still available. I haven't seen a black lotus in person since 1999. That would be pretty cool. Hurrah! That's beautiful. "I've seen things you wouldn't believe..."
Looking forward to reading any further analysis of the manuscript. BTW you need to post more. Like way more. You also need to post more videos. Like way more. Totally love your book Playing at the World. Did I miss something regarding the draft? Is it just the pre-print version with no variations aside from typos or are there larger discoveries there? Will we ever see a scan of this document? I can't be at gencon but I would love to see this.